I made a creamy and dreamy breakfast porridge but this is my super comforting creamy and dreamy dinner suggestion. The evenings are longer and colder and I think we all need some love at this point, for me risotto is one of those foods that feel like an embrace. Here I have taken something very traditional like mushroom risotto and made it untraditionally vegan but I promise you it still has that luscious texture! When people here risotto they think “that’s a hard dish to make” but I’d like to argue that this is not true. It might be a labour of love in some respects but it’s not difficult as such. All it needs is a lot of attention and care but some would say somewhat burnt risotto is the real deal and a delicacy. By that I don’t mean completely charcoal burnt but a little bit stuck to the pan and scraped into the creamy remainder of the dish. In this recipe I used Arborio rice but you could also use Carnaroli or Vialone Nano. 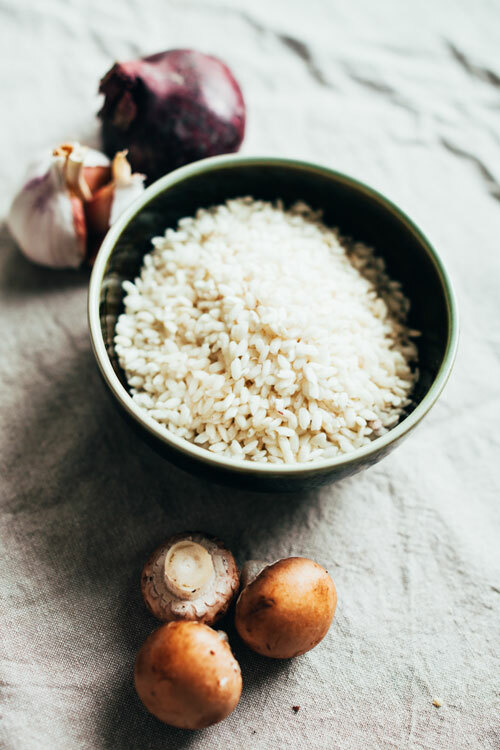 Arborio is the most well known rice for risotto making in my neck of the woods and also the easiest to find at the supermarket however I saw that Jamie Oliver has Carnaroli rice in his range so that could be an option, although that is not organic. 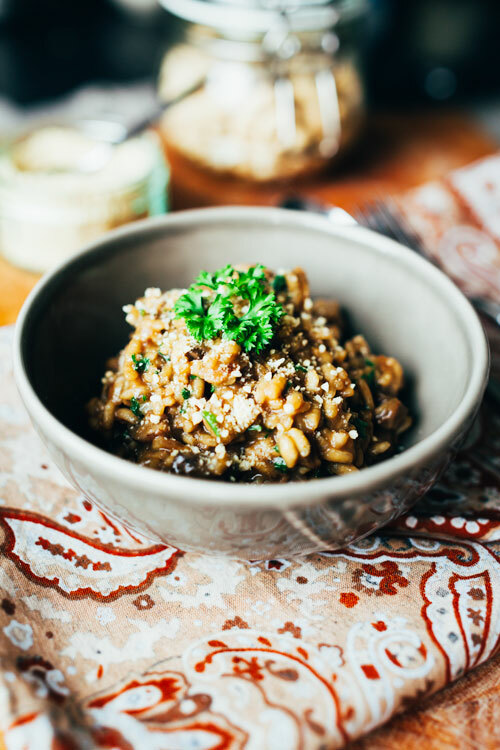 I also use dried Porcini mushrooms in the recipe which can be found easily at a well stocked supermarket but if you don’t have any and still want to make this risotto that’s cool! Just skip the bits about soaking and just use hot water to dissolve your stock in. I’d also add some more mushrooms of your own choice. It does have more of an intense mushroom flavour however with the Porcini mushrooms and a richer and darker colour. To finish of this recipe I make a so called vegan nut parmesan, really this is just cashew nuts ground with nutritional yeast and salt to create a crumbly cheesy dust for a nice final touch. This is not a must but I do recommend it both for flavour and visual effect! 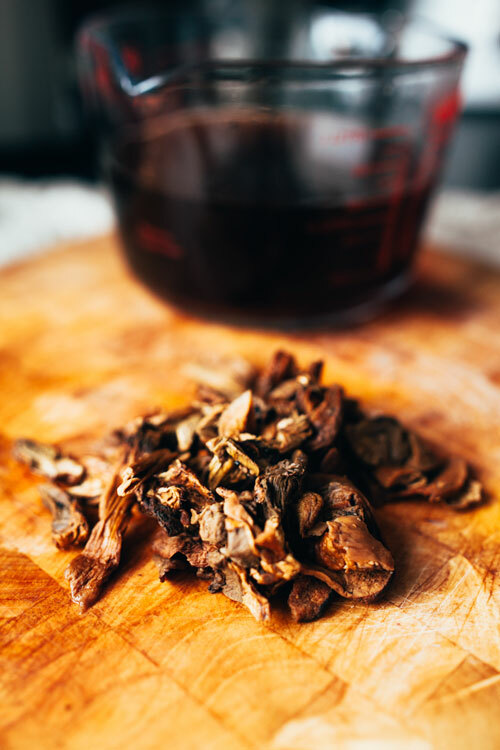 Boil the water in a kettle and pour into a large bowl containing the dried porcini mushrooms, let sit for roughly 20 min. 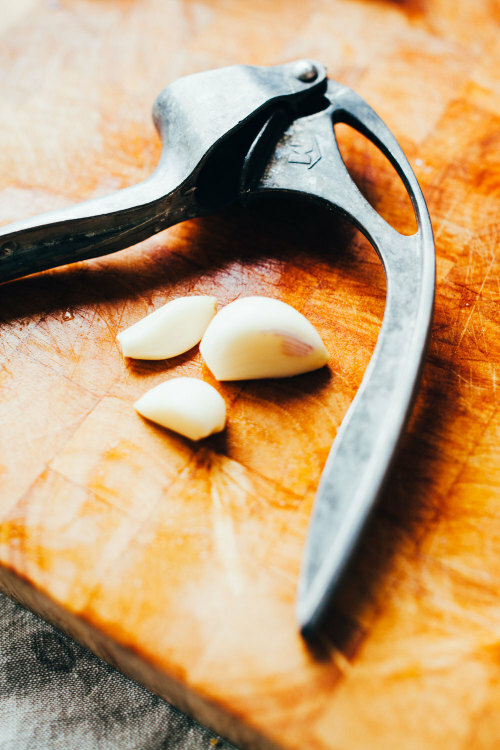 Chop red onion finely and peel garlic. Clean dirt off chestnut mushroom and remove excess stalks, then halve/quarter depending on size and preference. Place oil in a pot over medium heat and add onion, mince and add garlic, cook for roughly 5 min – mixing often. Meanwhile drain the dried mushrooms into another bowl, keeping the brown water but discarding the very last drops. Squeeze the last of the liquid out of the mushrooms and roughly chop them, add them to pot along with chestnut mushrooms and let cook on medium heat for another 5 min or so until tender. Add stock to the mushroom water and dissolve it. 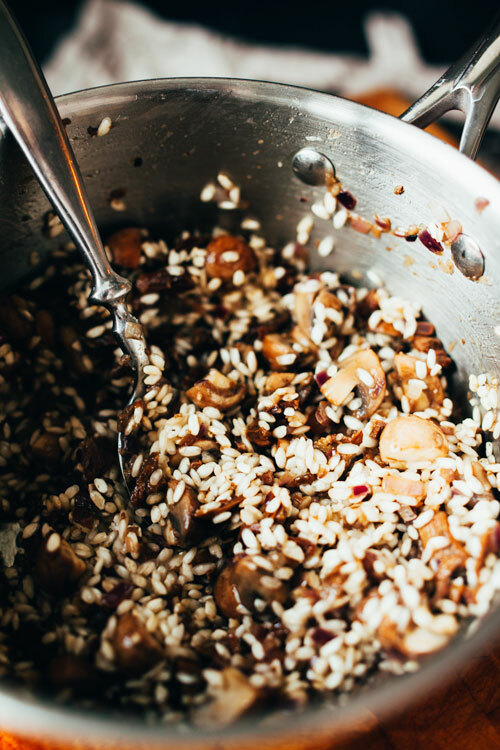 Add rice to pot when the mushrooms are tender and cook for a minute, making sure nothing sticks to the pan. Add mushroom water stock mixture into pot a quarter at a time, stirring often and only adding more water when previous has been absorbed. Roughly chop parsley and when all the stock has been absorbed and rice is tender, take the risotto of the heat and stir in the parsley. 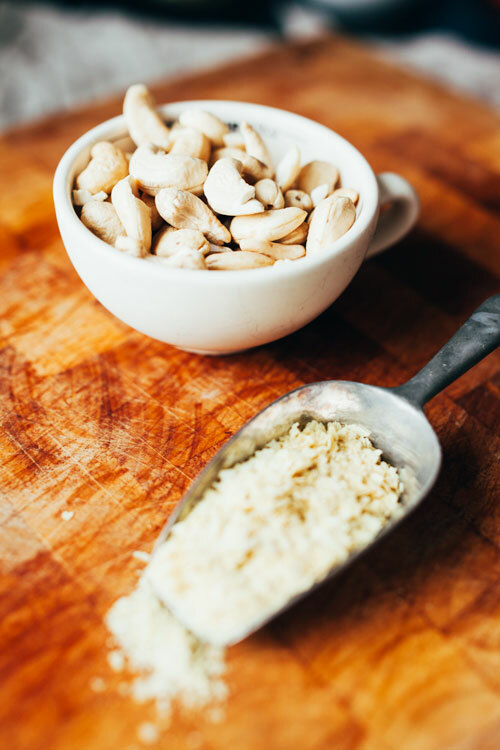 In a food processor mix cashew nuts, nutritional yeast and salt until finely ground, sprinkle over risotto when serving and finish of with some fresh parsley. Enjoy on a cold winter evening and if you end up with leftovers make these super simple arancini balls! 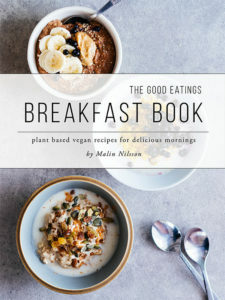 Looks delicious and the vegan Parmesan is a great touch! Thank you Millie, I’m so pleased you like it! Oh, I’m really glad you like it and I hope you’ll get to try it soon!